The palace was rebuilt in 1685. 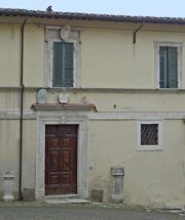 However, the inscription over the main portal (number 23)commemorates Bishop Cesare Nacci (1484-1504), which suggests that it survives from an earlier building. ✴the inscription (1627) above the window above the portal to the right (at number 21a) commemorates Bishop Domenico Pichi (1623-33). ✴The one on the left of the main entrance (CIL XI 4367, 50-100 AD) records that Siccia Secundilla erected a funerary altar to Caius Lusius Strabo, a priest of the cult of Victoria and Felicitas, and his son, Caius Lusius Modesto. ✴The one on the right of this entrance (CIL XI 4439, 50-100 AD) seems to be a funerary inscription erected by a brother and sister to their mother. ✴The one at the far right (CIL XI 4395, 150-200AD) commemorates Titus Petronius Proculus, who provided bread and wine for the "lusus iuvenum", games for young men, in honour of Victoria Felicitatis Caesaris. The young men are referred to as “iuvenes Augustales”, which indicates that the games were associated with the imperial cult. 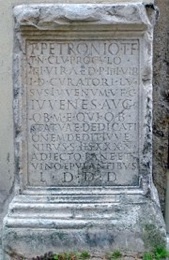 The inscription is on a marble slab that was probably the base of a statue. Return to Monuments of Amelia. Return to the Walk around Amelia.